Selecting your Investment Advisor is one of the most important decisions you will ever make. They will be responsible for the preservation of your wealth. There are specific questions you should always ask before hiring an Investment Advisor. Having information such as where your assets are held, and how your advisor gets paid should heavily influence your decision. The solvency of the company should be constantly monitored, and personal service should be of the highest priority. Of course we would like you to choose Caldwell Trust Company If you are currently in need of trust services, investment management, estate planning or retirement planning services, but if you choose to not work with us, we want to make sure that you find a reputable company to work with. How do you build that trust? 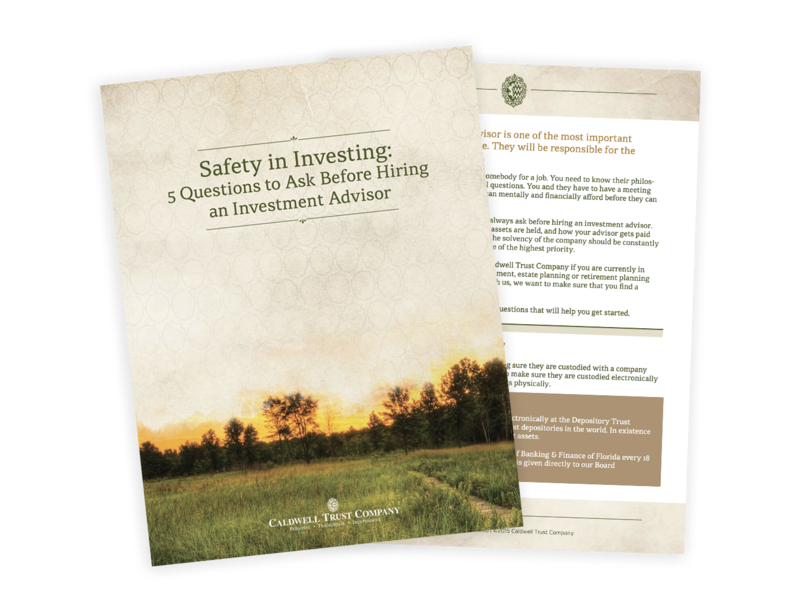 Download 5 Questions to Ask Before Hiring an Investment Advisor and get started. Enter your information and download your own copy.